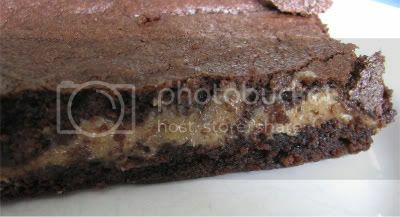 Last week for Friday's Fave Five, I included a photo of peanut butter-filled brownies. As promised, here is the recipe. 1. Heat oven to 350F. Grease an 8x8-inch baking pan. 2. Mix the filling from the Chocolate Peanut Butter Cups recipe. Set aside. Mix sugar, butter, vanilla, and eggs. Stir in remaining ingredients. 4. Put it all together and bake. Spread about half of the batter in the pan. Drop spoonfuls of peanut butter filling onto the batter, and carefully spread it over the surface (without going too close to the edge of the pan). Drop the remaining batter, by spoonfuls, over the filling. 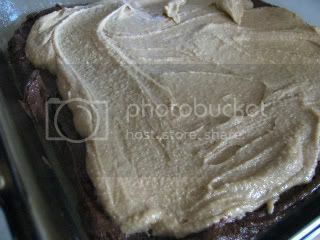 Spread it carefully to cover the peanut butter layer. These are delicious whether they're warm, chilled, or frozen. We forgot to try them at room temperature, so I guess I need to make another batch! Enjoy!I'm linking up to Chocolate Friday! Oh My Goodness!!! This looks and sounds heavenly. It is on my next treat day list. Thank you for the recipie. Ooh! That peanut butter filling recipe is a keeper all by itself (simple and versatile! I've got all kinds of possibilities running through my mind)! :-) Nom, nom!! Those sound super extra tasty. I'm going to print this out and see if the teen wants to make them. She loves to bake. Oh my goodness my dear so have to try these out!! I'm hoping to make the cupcakes for Cole's VBS this week. I have a feeling that these will show up on my counter before the day is over! At least I dearly hope so! Yum! I just turned these into individual peanut butter filled brownie bites in my mini muffin pan.... so awesome!! !